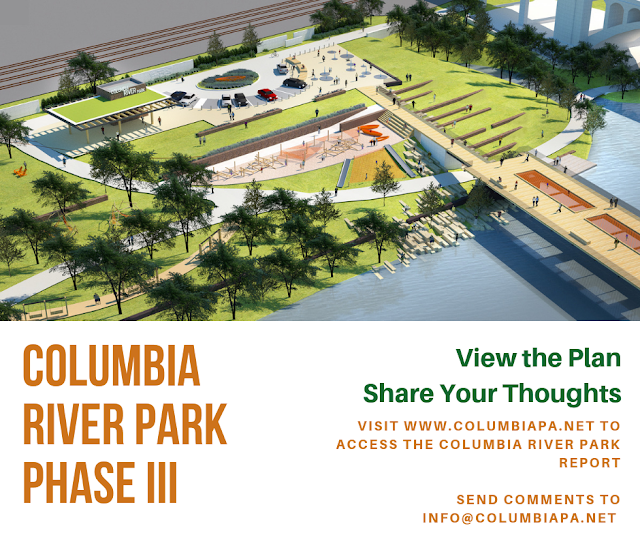 Columbia Borough recently unveiled the final draft of its Columbia River Park Phase III Master Plan. Features of the plan include an amphitheater, river hammock, and walking trails. WGAL offered a look at the project HERE. Links to documents for the plan are posted at the borough's website HERE. Go for it , hay how about a bridge across the old r/r piers so people can walk from Wrightsville for concerts, and why stop there, a bride across the rail road tracks from the 441 bypass for there 2nd enterence , oh more police to direct traffic and watch concert goers. Maybe the stage could be on a cement platform above the r/r tracks to save space.Why stop at 8 or 9 million when they say people from around the area will help pay for it, REMEMBER build it and they will come ,but help pay will be determined. Great plan made by consultants who will never visit the park and seconded by an advisory board whose members have probably never walked the trail from Cola to Marietta. It's out of control, please elect new members this year. NO. The ONLY ones paying for this Taj Mahhal is TAXPAYING WORKING HOMEOWNERS. AND WE SAY NO. NO. NO. NO. Spend that money getting a program to rid this boro off 600 or 700 rental properties. really. people speak up or forever hold your peace. This is a flood area! Who is going to pay the flood insurance!! Why dont all of you pessimists go crawl back under the rocks that you came from. We dont need you in the real world or future. Did you every go back to your "ROCK" Do you see a good future with what is going on in the world! Why don't you wake up and smell the cesspool in this town that is run by "The Magnificent Seven"!! Wow put your own money into it,look at the hole in the ground on locust street and what that company is trying to do in lancaster and it is not flying, look at the rest of towns needs. THE MONEY PIT IS BIG ENOUGH, let these people use or raise there own money , NOT THE TAX PAYERS. Why will no one answer how much time the borough workers spend at the pit? The borough has hidden a lot of things like the heaters , rocking chairs , and just plain misuse of tax payer money.These ideas for a poverty town are so far out there that these people are crazy , this town needs new blood to get the town (not the money pit) back on track , give the tax payers a break , then maybe we can in prove the look of the houses, the way it is going now it will be mostly rental houses here , because people will not be able to live here , and people will not buy these houses with the highest taxes around,so what that going to the money pit being there for outside people to come and look at a town of poverty. THIS IS COLUMBIA NOT some bigger town that has a great amount of tax money to use , you can NOT compair it to other towns of greater area .If this is what the borough inexperenced manager wants ,WHY DON"T SHE MOVE HERE instead of just taking our tax money and going home???? So, eternal optimist, how often do you visit the river park and have you ever walked the trail to Marietta? I agree a lot of these things are her ideas. A study for parking down town our town has been fine for years with parking when there were more businesses there too. Locust street is a disgrace in the 300 block. Instead of wasting money on a big hotel Hotel Locust and the bldg next door could be made into a small one. Also the market house could be a skating rink to give kids something to do in town. We have enough eating places and with our taxes who can afford to eat out. Antiques young people aren't interested in them. Historic District is big enough young people could care less about that too. There are other cemeteries that are old too. Yes the boro manager should live here since she is taking our tax money for her salary. All boro employees should live in Columbia too many inside jobs are given out not many are advertised. Move her and the mayors offices to the basement of the market house. An ice cream parlor and coffee shop is in the works at the old rail road station. This is at front and walnut st.
Who will be the owner of that? Is this another secret? The best of luck to them, I hope codes don't give them problems. 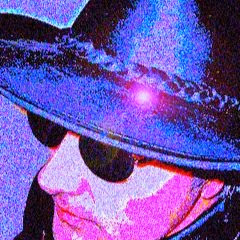 The codes where waved for this project! remember "they who have the GOLD, shall make the rules"
DISCRIMINATION codes is for all or none, this is some of the things that got the law suit going, this group of control people have to go , ALL OF THEM including the consultant!!!!!! !